... one of the world's largest museums, the most visited art museum in the world and a historic monument. A central landmark of Paris, it is located on the Right Bank of the Seine in the 1st arrondissement (district). The museum is housed in the Louvre Palace (Palais du Louvre) which began as a fortress built in the late 12th century under Philip II. Remnants of the fortress are visible in the basement of the museum. The building was extended many times to form the present Louvre Palace. In 1682, Louis XIV chose the Palace of Versailles for his household, leaving the Louvre primarily as a place to display the royal collection, including, from 1692, a collection of antique sculpture. During the French Revolution [1789–1799], the National Assembly decreed that the Louvre should be used as a museum, to display the nation's masterpieces. The size of the collection increased under Napoleon and the museum was renamed the Musée Napoléon. After the defeat of Napoléon at Waterloo, many works seized by his armies were returned to their original owners. The Louvre Museum in Paris is laid out into four sections or wings, each of which serves its own purpose. 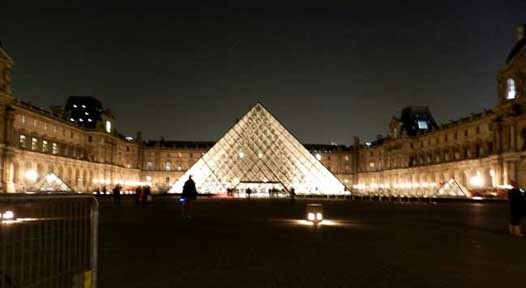 The heart of the Louvre Museum is the Carrousel du Louvre which is where the famous glass pyramid... is located. This pyramid was designed by the American architect I.M. Pei [and finished in 1989]. The Dennon section of the Louvre Museum Paris is a 500 meter long hall with rooms branching off it that runs parallel to the river Seine. The Richelieu wing of the Louvre is situated adjacent to the Rue de Rivoli, while the Sully end of the Louvre Museum forms the eastern part of the museum. The Louvre was created in several phases. Originally built as a 12th century fortress, it was converted into a royal palace in the 14th century. Its current appearance goes back to the 15th century, when the original fortress was demolished and the wing along the Seine river was built. The palace was extended during the 16th century by architect Pierre Lescot, who expanded the palace into a complex with two courtyards. A decade later Catharina de Medici added the Tuileries palace to the west of the Louvre. Construction on the Louvre was halted for some time when King Louis XIV decided to move to the Versailles Palace. In the 19th century, during the Second Empire, the Louvre was expanded again with the addition of the Richelieu wing. The Louvre now had four symmetric wings surrounding a large courtyard. This would not last long, as the Communards burned the Tuileries palace in 1871, opening up the west side of the palace. The collection of the Louvre Museum was first established in the 16th century by King Francis I. One of the works of art he purchased was the now famous "Mona Lisa" painting. The collection grew steadily thanks to donations and purchases by the kings. In 1793, during the French Revolution, the private royal collection opened to the public. The most recent addition to the Louvre was the construction of the glass pyramid, which functions as the museum's main entrance. The pyramid was built in 1989 by the renowned American architect I.M. Pei. The glass pyramid allows the sunlight to come in on the underground floor. The first Louvre was a fortress built at the beginning of the 13th century by Philip II Augustus to defend the Seine below Paris against the Normans and English. It consisted of a thick cylindrical donjon (dungeon) surrounded by towered walls. This château, enlarged and embellished by Charles V in the 14th century, was sacrificed in the 16th century at the end of the reign of Francis I in order to make room for a new Renaissance structure of the same size. Only the west wing and part of the south wing of the projected palace, conceived by the architect Pierre Lescot ... were finished. In 1564 Catherine de Médicis had her architect, Philibert Delorme, build a little château in a neighboring field to the west called the Tuileries. It was then decided to create a grandiose royal residence by joining the Louvre and the Palais des Tuileries by a series of buildings. The most important is the Grande Galerie built along the Seine in the reign of Henry IV. In the 17th century Louis XIII and his minister Richelieu extended Lescot's west wing northward by adding the majestically domed Pavillon de l'Horloge (clock pavillion) by Jacques Lemercier and recreating Lescot's building beyond it. Under Louis XIV and his minister Colbert, the Cour Carrée, a great square court, was constructed by Louis Le Vau. The east façade of the east wing was later given a classical colonnade by Le Vau and Claude Perrault. The royal apartments were sumptuously decorated by Charles Le Brun and others, as the Galerie d'Apollon still bears witness. The Louvre was abandoned as a royal residence when Louis XIV moved the court to Versailles in 1682. After the Revolution of 1789, Napoleon I, later kings, and Napoleon III lived in the Tuileries. The Louvre was used for offices and a museum. Along the Rue de Rivoli, Napoleon I began a wing parallel to that of Henry IV along the Seine. Napoleon III finished the wing, thus closing the great quadrilateral. A few years later, during the uprising of the Paris Commune in 1871, the Tuileries was burned. Paradoxically, the disappearance of the Tuileries, which had originally brought about the extension of the Louvre, opened the admirable perspective that now stretches from the Arc du Carrousel west through the Tuileries Gardens and the Place de la Concorde to the Place Charles de Gaulle.